Hi friends! 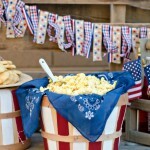 Are you gearing up for the 4th of July, which will be here BEFORE you know it?! 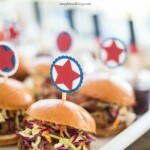 It’s one of my favorite times of the year – chock full of BBQs, family, friends and fireworks! Who doesn’t love the fireworks?! 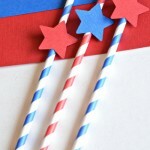 Well if you’re a fan of the big Red, White and Blue – have WE got a post for you today! 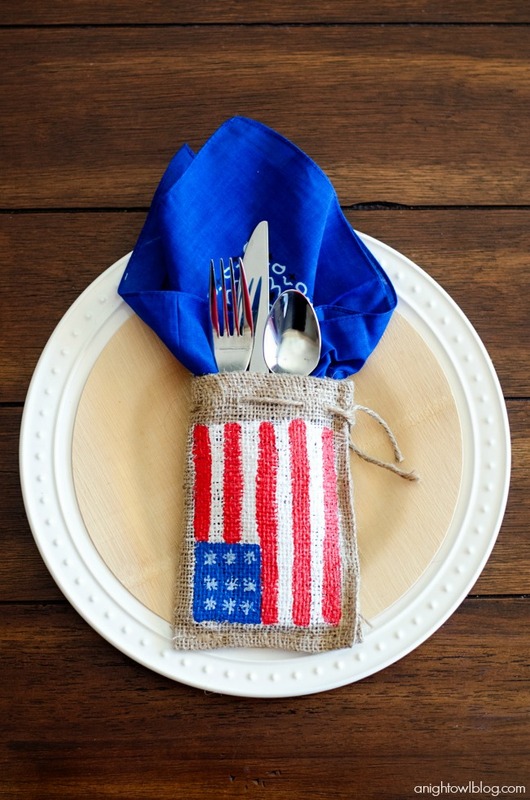 Not only am I sharing my latest FAVE Red, White and Blue project – these Painted Burlap Patriotic Place Settings – BUT if you head on down to the end of this post you’ll also find links to OVER 100 MORE amazing Red, White and Blue crafts, recipes and more! Everything you could ever want to prep for the upcoming holiday. Now that’s what I’m talking about…so make sure you HOP around to some more great projects once you’re done here! 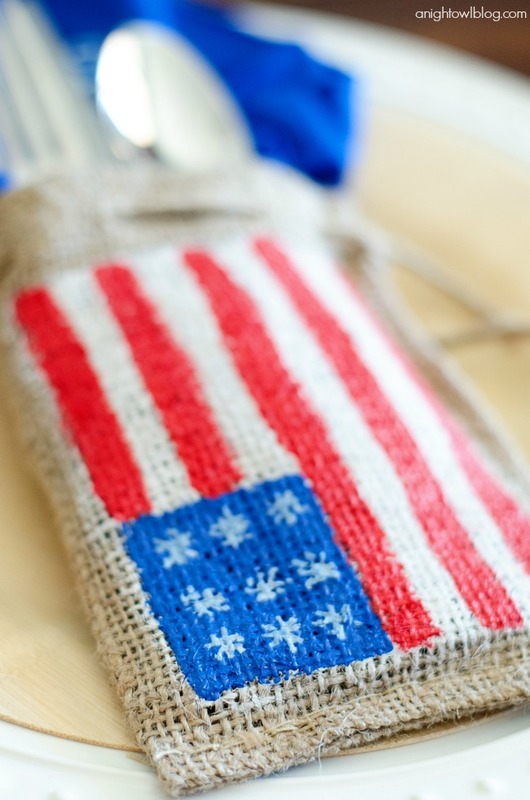 Paint the top of the bag white, which will be the base for your flag, allowing the red and blue to pop! 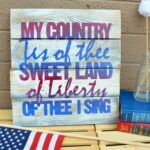 Once the white is dry, paint a blue rectangle in the top left and add red stripes to the flag and let that dry as well. 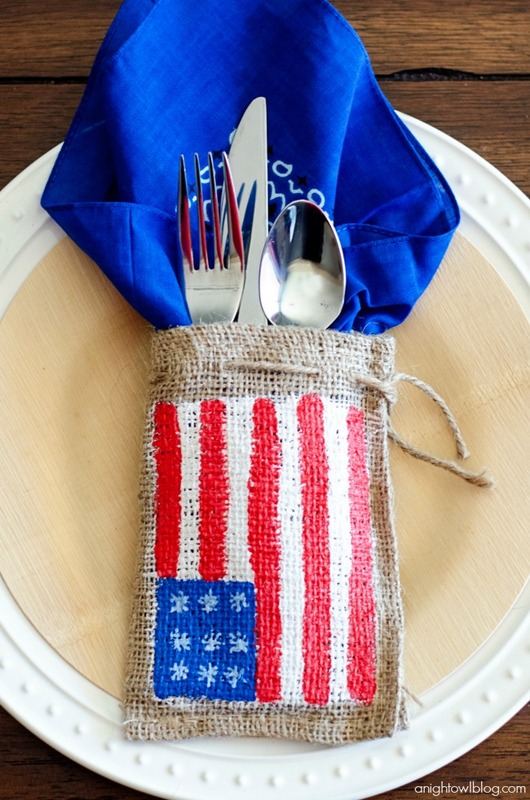 Once your Red, White and Blue areas are dry, add stars to the blue area. I used a chalk pen that was handy to draw them on easily. And what you’re left with when you’re all done? 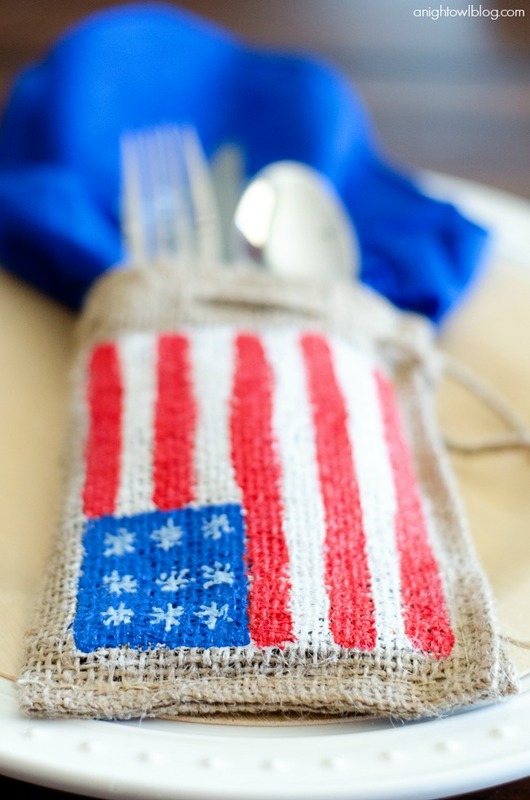 One adorable flag-painted bag, the start to amazing Painted Burlap Patriotic Place Settings! I mean, eeek right? So stinking cute! I asked my boys like 100 times how much they loved how they turned out and I really couldn’t drum up much excitement. But you’re here with me, right? 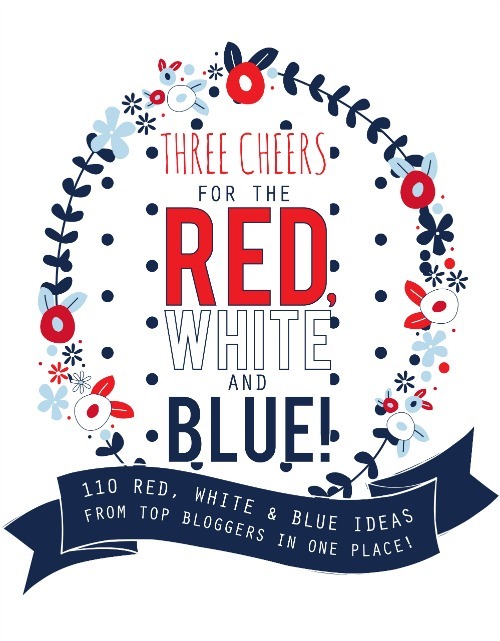 Now how about that for a Red, White and Blue project? But now are you ready for MORE? Click around and have some fun! Be inspired and tell me which ones you’re loving! oh my heck those are soooooo cute!!!!!!!!!!!!!! This is a clever idea. Love it. This is so so adorable! 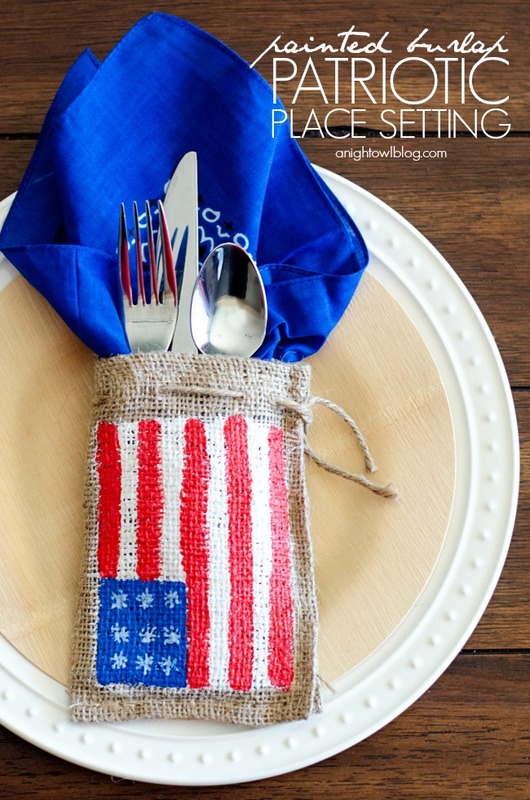 I love simple but fun projects and this one is ideal! 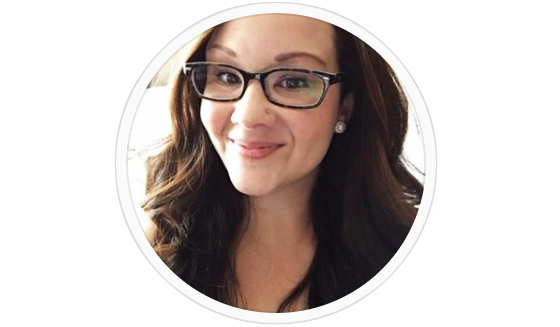 I’d love you to stop by and share at our link party going on now, if you’ve not already.